The OU Medicine Corporate Challenge, held each June, brings local businesses and their employees together for a weekend of athletic competition, team building, and goodwill. 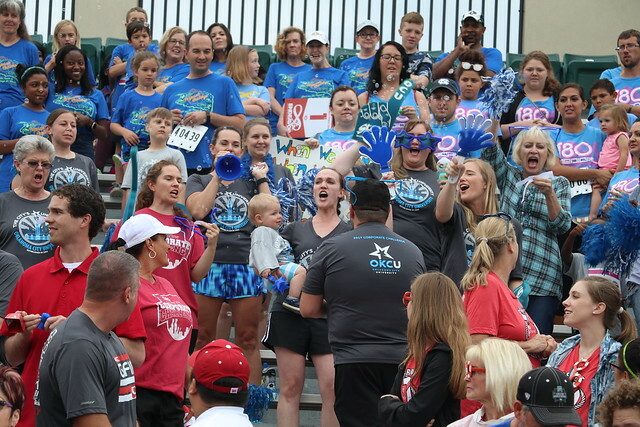 The 2019 Corporate Challenge will take place on June 1 and 2! The event also raises funds to support the University of Central Oklahoma’s Endeavor Games, an athletic event for children, adults, and military service members with physical disabilities. Since 2014, OCU employee-athletes have represented our university at the Challenge by competing in individual and team events including sprints, relays, dodgeball, volleyball, obstacle course, basketball, distance running and more! Move your cursor over the photo below, then click the arrow to scroll through the rest of our Corporate Challenge 2017 photos! OCU employees are encouraged to support the Corporate Challenge by joining the university’s team of employee-athletes June 2-3, participating in fundraising events in support of the Endeavor Games, and volunteering during the event weekend. Additionally, the event welcomes kids ages 5 to 17 for a kids fitness challenge. There’s no need to be a star athlete. Our team is built on employee-athletes looking for a challenge, trying out new physical activities, and engaging in cross-campus fellowship. If you’re not interested in an athletic event, we need volunteers for the Challenge weekend as well as spectators to cheer on our team! Invite your families to join us for food and fellowship in our team tent. Why should I be on the OCU Corporate Challenge Team? Help set an example for other OCU colleagues, students, and your family members. Show them how fitness really can be fun! Feel the thrill of victory or the agony of defeat; in the end, everyone celebrates by taking part! Let your hair down, and HAVE FUN!